Skeese Greets: Diez y Seis! It's Mexican Independence Day and that can only mean one thing - margaritas! OK, not really but that's how I plan on celebrating. Today, September 16 is actually an important day in Mexican history; it commemorates the day in 1810 when Father Hidalgo called for the fight for liberty from Spanish rule. Eleven years later, the war ended with a victory for Mexico. As a Texan, Mexican culture has greatly influenced my life and I'm grateful for it. 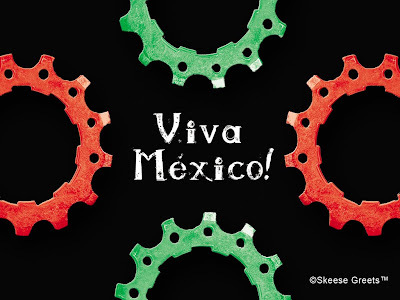 I created a special "Viva Mexico" screen saver for the day, which like all other Skeese Greets designs, incorporates bike parts. It's only available as a full screen image at 1024x768. How to install: Click on it, then right click & "Set as Desktop Background." The fine print: Skeese Greets™ makes this content available for personal, desktop use only . All copyrights remain the property of Skeese Greets™.